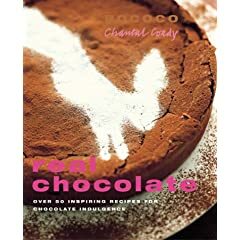 In Rococo Real Chocolate Chantal Coady, proprietor of London&apos;s exquisite Rococo Chocolates in King&apos;s Road presents over 50 groundbreaking and highly unusual recipes that anyone can make at home. Painstakingly tested and illustrated with beautiful, easy-to-follow, step-by-step photographs, the book makes the mysterious art of chocolate accessible to the amateur home enthusiast. Coady is an ardent proponent of what she calls “Real Chocolate” and explains the difference between excellent natural ingredients – the only used in Rococo recipes – and the over-sweetened, fat and additive-laden confections most widely marketed in the world today. Simply put, “Real Chocolate” is chocolate made with only the very finest all-natural ingredients. Fun to make and divine to taste! Recipes will include basics like plain and flavoured ganaches and truffles, decorative chocolate leaves and curls; unusual offerings like chocolate tempura and white chocolate and cardamom pannacotta, and savory recipes like black beans with ginger and cocoa, and chocolate tapenade. The book is also filled with amazing chocolate lore from irrefutable evidence of chocolate&apos;s physical and mental health benefits, to the fact that white chocolate is the closest thing found in nature to human breast milk! via Salads books: Indulgence or Real Chocolate.